N.B. Our latest blog post on cart abandonment campaigns can be found here. With billions of pounds of shopping left in virtual shopping baskets each year, cart abandonment is an infuriating reminder of revenue that might have been made. The customer has spent time browsing your site, has carefully selected items that have taken their fancy but - for one reason or another - he or she has abandoned ship at the critical point. Maddening, right? Unfortunately cart abandonment is probably here to stay: it’s just symptomatic of the way some people browse and shop (and according to the Baymard Institute, the average documented online shopping cart abandonment rate is 68.63%). 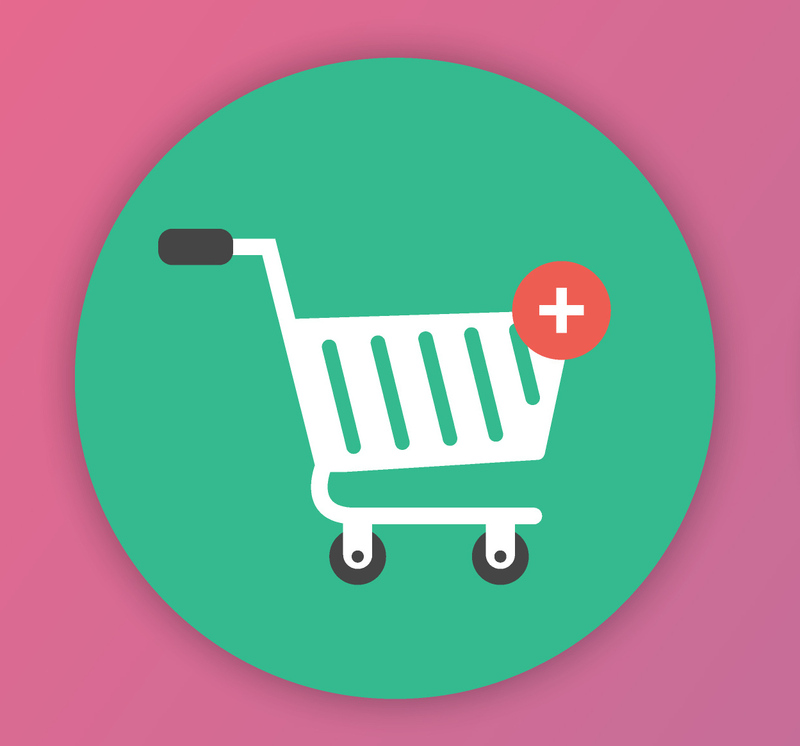 Many online retailers are taking proactive measures to reduce cart abandonment rates - after all, if you can tempt even a small percentage of those who’ve abandoned their purchase back to complete the process (or even prevent them from abandoning the checkout in the first place), that can represent a significant amount of regained revenue. 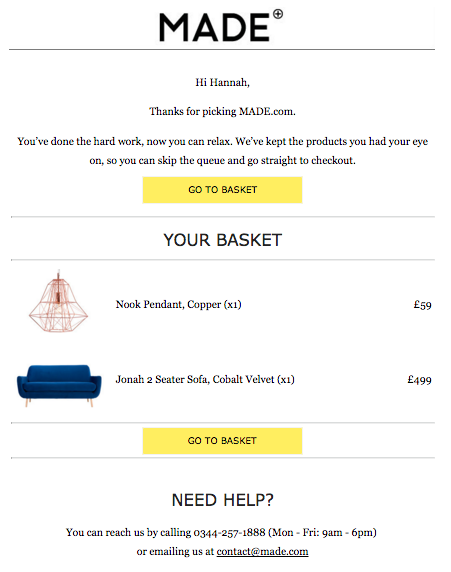 This post will focus on one popular tactic: basket abandonment emails. 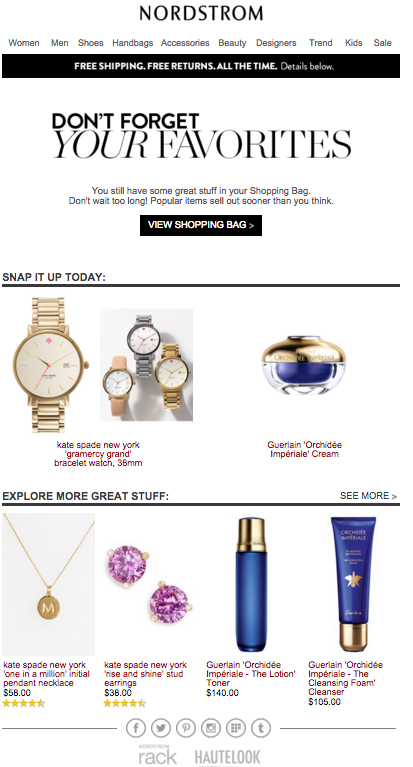 According to remarketing specialist SalesCycle, implementing this type of triggered email gets results. This post will map out the features that make a great cart abandonment email, and then offer some examples of best practice from a number of top retailers. When you’re sending someone an abandoned cart email, the main goal is to get them back to their basket, credit card in hand, ready to complete their purchase. But what if they left simply because they changed their mind and didn’t want the item so much after all? Incorporating your website’s regular navigation into your email might well encourage them back onto your site ready to buy something else that’s more up their street. Be as specific as possible, as your recipient might have visited a whole heap of websites and added things to basket on all of them. Including an image of the product that they added to their basket is also a must, as people often respond better to images than text on its own (it’ll also serve as a better reminder of what they’re missing out on). Give as much detail as possible, including price, colour and the size that they selected. Above all, remember to keep the tone helpful, not pushy. If it turned out that the recipient didn’t like the item they added to their basket so much after all, providing them with images of other popular or related items in your store is a great way of getting them back and shopping. Delve into your data to see which items are popular basket top up items with this product and make sure they’re displayed in your email (with pictures). Social validation has been proven time and time again to have a significant impact on online purchasing decisions. A lot of stores display reviews on their product pages to help seal the deal - why not pick the most favourable (providing that you actually have a positive review of the item, of course!) and display it in the email? It might provide the nudge that the recipient needed. Why we love it: MADE puts our abandoned items at the centre of the message to get us back to the checkout with strong visual cues to repurchase. Why we love it: ASOS uses a large image and a moving GIF-based logo to catch the attention of would-be buyers. 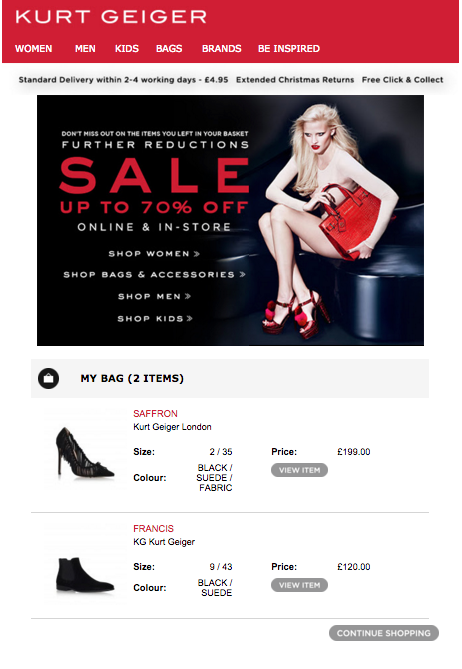 Why we love it: Kurt Geiger didn't waste any time cross-promoting their current sale, as well as reminding us of the lovely heels we left behind. Why we love it: JOY goes all out with its product recommendations at the bottom of this email, tempting us back to the website to buy. Why we love it: Mothercare gives us plenty of information about how to contact customer service with any questions about the product in question. Why we love it: Fat Face’s email includes a huge call to action right under the product images that demands that we complete our order. Why we love it: Mango’s email reminds us about every detail of the abandoned purchase, including the size, colour, quantity and price of items left in the basket. Why we love it: This is an example of abandonment email copywriting perfection: not too pushy, it gets to the point and effectively conveys the brand’s image. Why we love it: Again, customer service is key in this email, with clear links to contact details and a helpful tone. 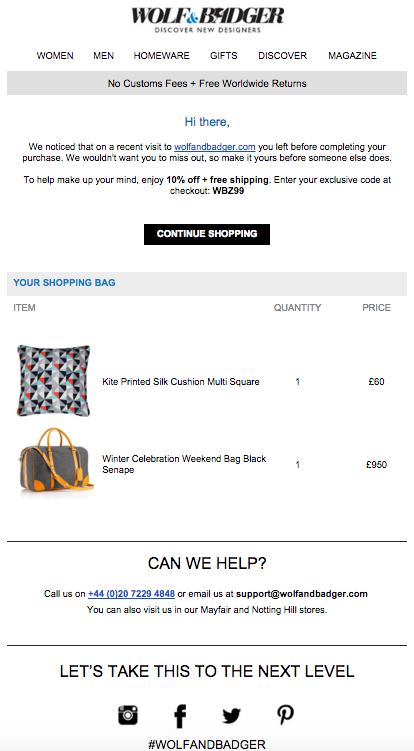 Why we love it: Strong shopping CTA's line this email alongside great visual reminders of abandoned items, and a cheeky cross-sell featuring some lovely social proof. Why we love it: Everyone loves a bargain - Wolf & Badger waste no time incentivising a repurchase with a nice discount and free shipping.